Earlier this month saw the launch of the ninth annual Technology Leadership Forum [TLF] Internship Programme and this year, five technology interns were successfully accepted in the summer programme. 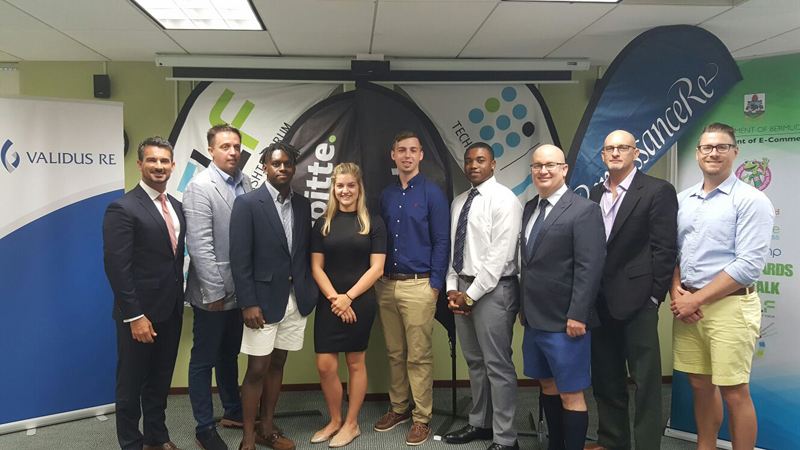 The 2017 TLF interns who passed the rigorous selection process are: Alex Dore, Cameron Moulder, Ezra Turner, Somer Froud, Zia Seymour. This week is the first of 3 training weeks that the interns will undergo in an intensive twelve-week summer internship programme that combines classroom learning, team projects, and fieldwork at participating companies. This combination of theoretical learning and on-the-job practice is to ensure that the interns acquire a rich experience in the ICT industry. Moreover, participants are encouraged to network and develop relationships in the ICT community during the programme which may then assist them as they eventually search for employment. The TLF was founded ten years ago as a response to the growing need for qualified Bermudian talent in the information communications technology [ICT] field. It aims to encourage Bermuda’s information technology [IT] students to become exposed to the many career paths which they can pursue in the industry. The TLF, a registered charity, is run in partnership between private sector organizations and the Bermuda Government. Ian Cook, CEO, BAS Group and Chair of the TLF kicked off the launch introducing Senator, the Honourable Jeff Baron, JP, Minister of National Security and key note speaker Andrew Newton Vice President, Head of Information Technology at Validus Reinsurance. It is expected that interns graduating from the programme will become esteemed and accomplished members of Bermuda’s ICT workforce through experiencing the programme and the specialized training offered. The TLF thanks all of its valued sponsors and partners who have tangibly demonstrated their support for the initiative. This includes: Validus Re, the Department of ICT Policy and Innovation, ACT, CCS Group, Deloitte, Link Bermuda, Regulatory Authority of Bermuda and RenaissanceRe. For more information on the Technology Leadership Forum’s Internship Programme, members of the public can visit www.TLF.bm.